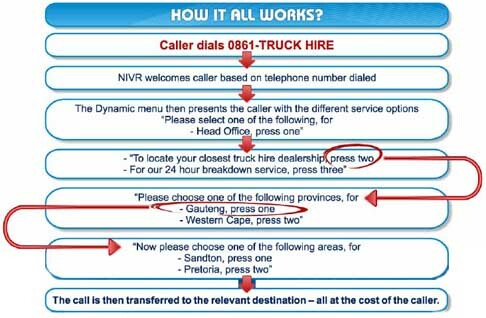 Our Network Interactive Voice Response (NIVR) Call Routing System enables us to route calls made to a single 0861, 0860 or 0800 telephone number from landlines and cellular phones to multiple destinations throughout the country. -	I have many branches/franchises/stores and need to route callers to the right destination. -	I don't only want a menu for regions, but am looking to customise further. -	Redirecting calls manually from a centralised location is costly and inefficient. -	I need a routing system that works for me after-hours. -	Our head office is not operating at the same times as stores. -	I cannot customise my current call routing system. -	I need accurate and in-depth reports. 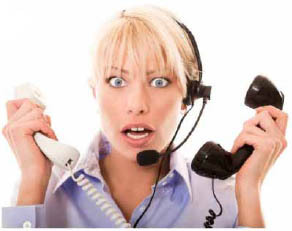 -	Callers are not being transferred to the right sales team by the call operator. -	I would like a customised caller recognition feature. -	My disaster recovery plan requires a solution where I can change destination numbers quickly. Then CALL ROUTING is your solution! Our clients are reaping substantial rewards from implementing this solution, which includes heightened efficiency and customer service. 2. Replaces the expense of call operators. 3. Avoids mistakes made by receptionists/call centre operators. 4. You don't lose out on sales due to inefficiency.